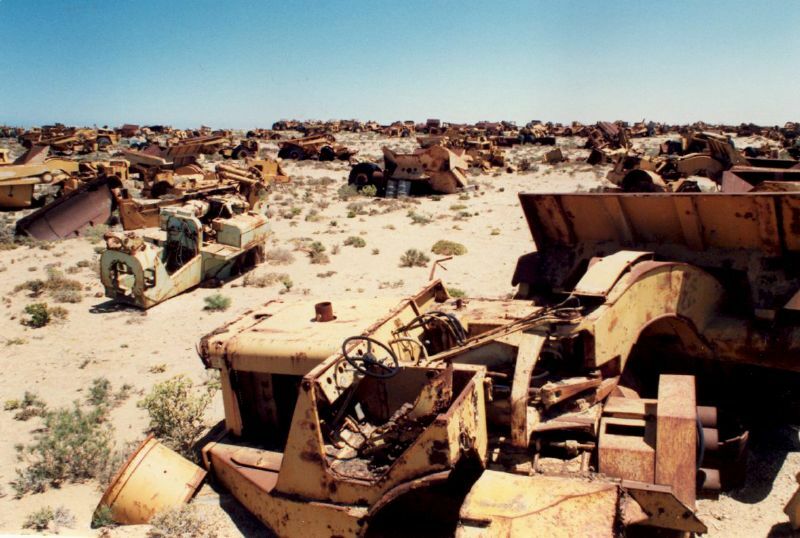 Vehicle graveyards are just that—places where vehicles go to die, slowly succumbing to rust until they are saved or scrapped. The decaying vehicles can often be an eerie sight, and many of the largest vehicle graveyards boast some fairly strange stories. High in the Andes, in the southwest of Bolivia, lies the Salar de Uyuni, the world’s largest salt plain. In 1888, as the local mining industry boomed, British engineers were invited to build a railway network that stretched down to the Pacific. Despite constant sabotage from the local Aymara indigenous people who saw the railway as a threat to their way of life, the lines were completed in 1892. However, by the 1940s the mining economy had collapsed as mineral deposits became exhausted. 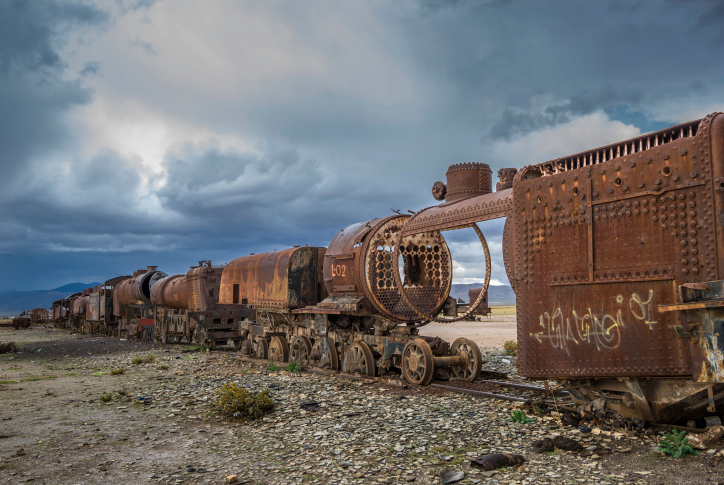 As the railway fell into disuse, many of the steam trains were simply abandoned on the salt flats. Even today, it makes for a strange sight: lines of rusting steam engines, many of them manufactured in the UK, baking under the desert sun. Since there are no fences or guards, most of the trains have had metal components stolen from them—some of the gutted parts litter the surrounding area. There are plans to turn the graveyard into a museum, but until then the trains are at the mercy of the locals and the environment. Until recently, the deep woods around the small Belgian town of Chatillon concealed four car graveyards, containing over 500 vehicles slowly being claimed by moss and rust. There is some disagreement over the origin of the vehicles. The most frequently repeated story is that the graveyards began at the end of World War II, when American soldiers unable to afford to ship their cars back home simply left them in the forest, with more being added over the years. Another, less interesting story holds that they were simply the remains of an abandoned junkyard. Most of the cars were produced in the 1950s and ’60s, and many were highly collectible. As such, a large number were missing parts, either salvaged by collectors or taken by souvenir hunters looking for trinkets. The last of the graveyards was cleared in 2010 amid environmental concerns, but plenty of eerie photos remain. Oranjemund, Namibia is a small town entirely owned by a company called Namdeb, a joint venture between the Namibian government and the De Beers diamond cartel. Located close to the mouth of the Orange River, it is home to large diamond reserves—the town was built to house the mineworkers. The area is incredibly restricted—armed guards patrol the perimeter and you’re not even allowed through the airport turnstiles without a permit. Anyone found in unauthorized possession of a diamond faces up to 15 years in prison and workers have been known to try and smuggle the gems out hidden up their noses or shoot them over the fences with homemade crossbows. On one occasion, a homing pigeon was discovered wearing a tiny jacket stuffed full of diamonds. Oranjemund is also home to one of the world’s largest earth-moving fleets, second only to the US Army. Once a vehicle enters the mine compound, it is never allowed to leave, apparently to stop them from being used to smuggle out diamonds. Some of the rusting machinery dates back to the 1920s and includes World War II tanks formerly used to bulldoze sand. Company executives used to proudly show off the collection, but now, conscious of their public image, have begun refusing to let photographs be taken of the graveyard. With a population of almost 100,000, Nouadhibou is the second-largest city in Mauritania—one of the poorest nations in the world. The city’s port, located on a wide bay, offers excellent protection for ships to shelter from the Atlantic and is the gateway to some of the best fishing grounds in the world. Iron ore extracted nearby is exported through the port, making it a minor trade hub. In the 1980s, locals began abandoning outdated and unwanted vessels in the shallow waters of the bay. 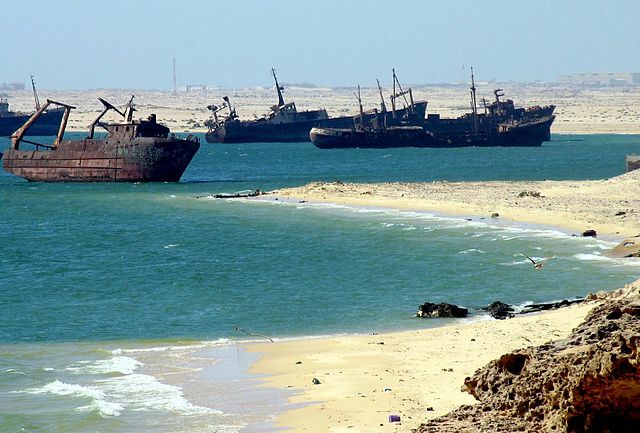 Before long, ships started to come from all over the world to be dumped in Nouadhibou, facilitated by local authorities only too happy to take a bribe to look the other way. From fishing trawlers to naval cruisers, a huge variety of ships now rust away in the shallow waters. One of the largest is the United Malika, which ran aground in 2003 while carrying a load of fish (the 17 crew members were rescued by the Mauritanian navy). Since then it hasn’t been moved. Despite measures to prevent further dumping, the number of abandoned ships continues to rise, albeit at a slower pace than before. As a major iron ore exporter, there has been limited incentive for locals to cut the ships apart for scrap. It isn’t all bad however—the half-sunk ships act as a breeding ground for fish and local fishermen often stretch nets between the boats. The government’s current plan is to use the ships to form an artificial reef in deeper waters, but little has been done since the plan was announced in 2001. 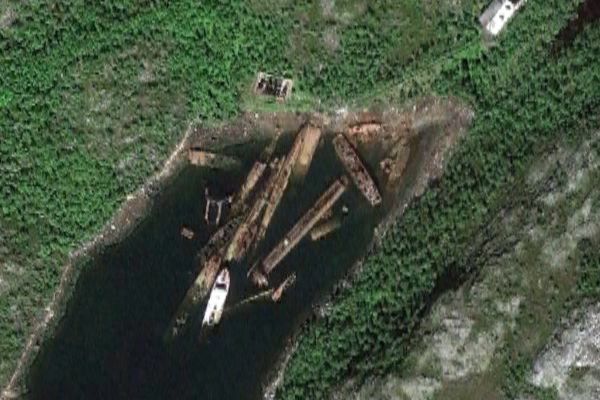 In Nezametnaya Cove, located inside the Arctic Circle in the far north of Russia, lies a Soviet submarine graveyard. Starting in the ’70s, military submarines, many of them nuclear powered, were simply abandoned in the cove on the isolated Kola Peninsula. The Soviet shipyards were apparently too busy filling orders for new submarines to care about disassembling the old ones. Access to the area is forbidden without a permit, so information on the graveyard remains limited. It is known that some of the subs were finally scrapped in the ’90s amid concerns over water pollution, but Google Earth images, pictured above, seem to indicate that there are at least seven remaining. In 1955, the newly nationalized British Railways announced a plan to scrap a wide swath of its aging fleet. The newly redundant stock included around 650,000 wagons and 16,000 steam locomotives. 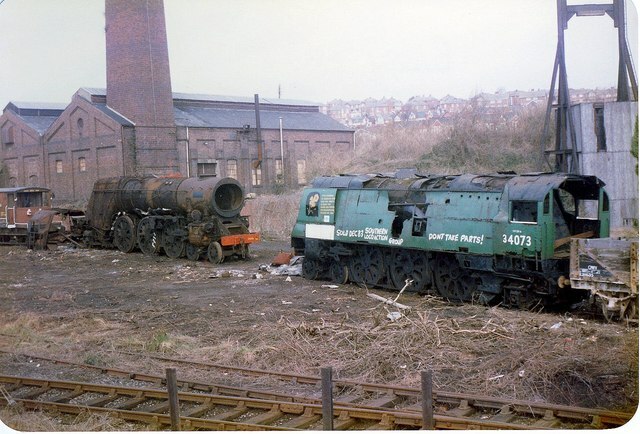 Due to the large amount of rolling stock to scrap, British Railways’ yards were unable to cope and many of the trains were sold to private scrapyards. Among them was Woodham Brothers scrapyard in Barry, South Wales. At first, the steam locomotives were cut up shortly after arriving, but by the autumn of 1965 owner Dai Woodham had decided to concentrate on the easier job of scrapping the large numbers of wagons that were rolling into the yard. The rusting steam locomotives were left out in the open, where they quickly became a popular tourist attraction in Barry. Enthusiasts of steam trains soon realized that Woodham Brothers offered a chance to obtain rare locomotives for the preserved lines that had started to open up around the country—many of the models in Dai’s yard were impossible to find elsewhere. In September 1968, the first “rescued” steam locomotive left the yard, and the pace increased throughout the ’70s. In the end, 213 steam engines were rescued for preservation, much to Dai’s surprise. The last one left Barry in March 2013. Dai, who died in 1994, was said to have been immensely proud of his part in saving the engines for future generations. Today, many of the steam locomotives from his yard can be found running on preserved lines around Britain. Beside the Erie Canal, in Lockport, New York, there was an aging warehouse that became legendary in the motorcycle community. The warehouse was once owned by a man named Kohl, who supposedly owned a number of motorbike dealerships over his lifetime. Buying cheap Japanese bikes and defunct dealers’ stock, he soon amassed a staggering number of the vehicles. He bought the building in the 1970s to store the vast collection before selling it off, contents included, in 1997. Mr. Kohl died in 2002, aged 80. The buyer, known only as Frank, intended to use the warehouse to start a company selling motorcycle parts. However, the building had fallen into a state of disrepair and Frank was unable to justify the cost of fixing the damage. Eventually, the warehouse was condemned by the local authorities, barring anyone from viewing the collection. 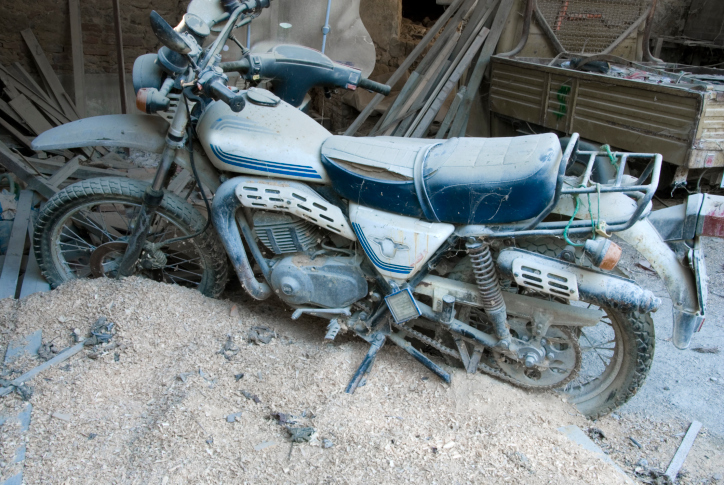 By November 2010, the bikes had all been cleared out, with many seemingly going to scrap. RAF Folkingham, in Lincolnshire, UK, was originally opened in 1940 as a decoy airfield for RAF Spitalgate—complete with fake planes and personnel—before being handed over to US control in early 1944. Douglas C-47 Dakotas stationed at the airfield were used during the D-Day landings. The base was handed back to RAF control in April 1945 and closed in 1947, after which British Racing Motors, a Formula One team, used the runways as a test track. It was re-opened by the RAF in 1959 and used as a site for Thor thermonuclear missiles until its second closure in 1963, when it was sold off for agricultural land. Today the site is owned by Nelson M. Green & Sons Ltd., which uses the old airfield to store hundreds of vehicles used to source spare parts. Among the vehicles are old Caterpillar bulldozers, fuel bowsers, cranes, and tractors, as well as ex-military lorries and armored vehicles dating back to World War II. 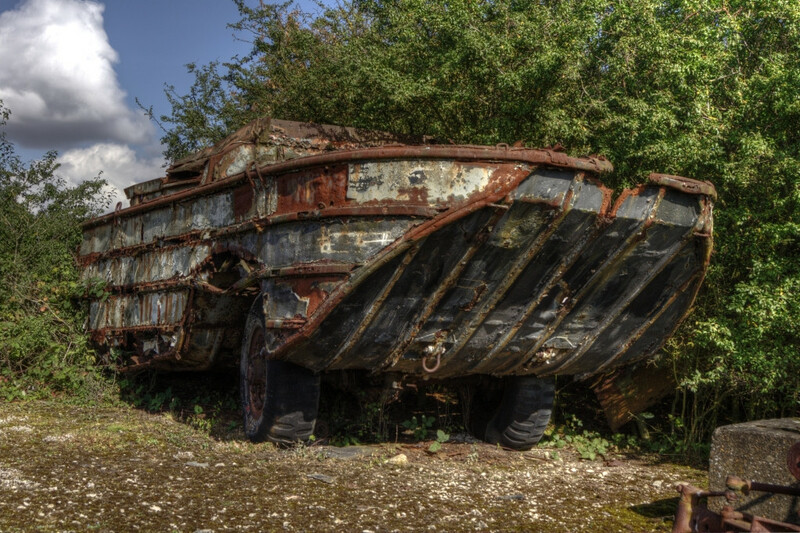 There is even a DUKW amphibious vehicle, pictured above, which was used in the D-Day landings. Also on site are three pads that housed the aforementioned Thor missiles. Today, the vehicles are still lined up, awaiting their eventual fate. After the Chernobyl nuclear disaster, it wasn’t just people and buildings that were affected by the radiation—so were the vast number of vehicles used in the firefighting and subsequent cleanup operation. Since the disaster, the majority of the vehicles have been sitting in huge graveyards, the largest being at Rassokha, awaiting their fate. However, not all of the vehicles are in the graveyards. The fire trucks that got to the disaster area first had to be buried deep underground. In the middle of most of the graveyards are the firefighting helicopters whose pilots and crew were among the most badly affected by the radiation. Scarily, locals have been caught attempting to salvage metal from the vehicles, despite the huge risks. The Ukrainian police have arrested a number of people for attempting to salvage one of the Mi-8 helicopters deployed in the operation, which they intended to use as a cafe. 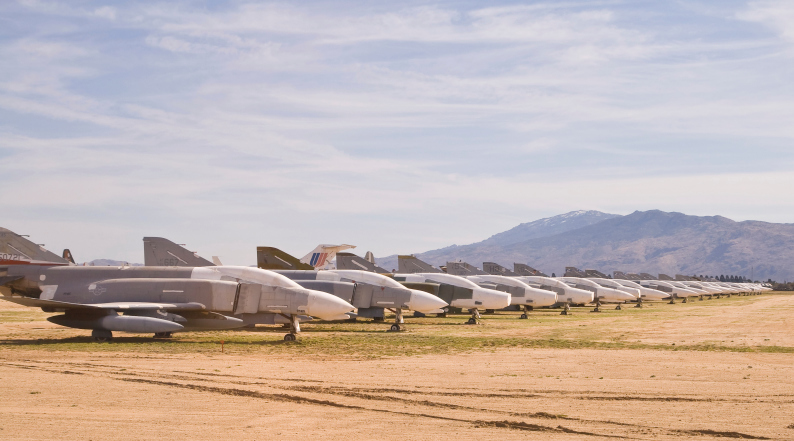 Officially known as the Davis-Monthan Air Force Base and home to the 309th Aerospace Maintenance and Regeneration Group (AMARG), the Boneyard is a huge aircraft storage ground located in the middle of the Arizona desert. The size of 1,430 soccer pitches, the Boneyard is home to more than 4,200 aircraft, worth around $35 billion, and is easily the world’s largest military aircraft cemetery. The Boneyard’s aircraft are divided into four categories: Category 1000 refers to those preserved and able to fly again if needed, Category 2000 are used for spare parts, Category 3000 contains planes in good condition and likely to eventually be redeployed, and Category 4000 refers to outdated aircraft likely to become museum pieces or be scrapped. Among the fourth category were many of the iconic B-52 bombers, scrapped after a 1991 arms reduction treaty with Russia. Arizona is perfect for the facility since its dry climate helps prevent decay. Unsurprisingly, AMARG works hard to prove that, rather than wasting government money, it in fact earns money through the sale of parts. Such is the fame of the Boneyard that you can even take a guided tour around the site. Will is an aspiring writer from the UK, whose other interests include filming and photography.